TWO wide-open, grey eyes, set deep in a pale, pinched face, and overshadowed by a wealth of badly-dressed, deep-brown hair. 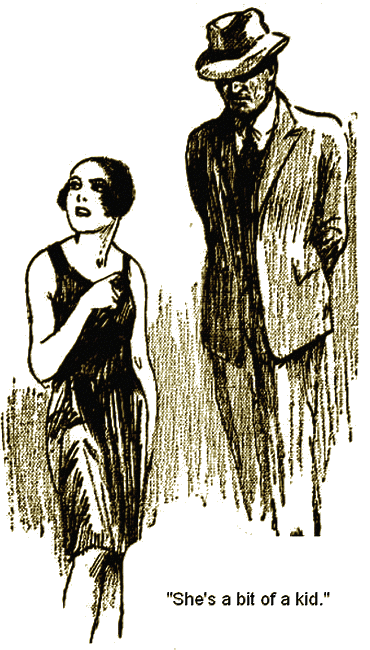 A slim boyish body, faintly outlined by the short, skimpy frock, vivid, flesh-coloured silk stockings, supported on stilt-heeled, light tan shoes. Detective-Sergeant Robert Greyson suddenly squared his shoulders, smoothing down the growing curve under his waistcoat, that was beginning to cause him concern. He realised that he had been staring at—analysing—the girl. He knew now that she was in trouble. Greyson pushed through the crowd of shoppers thronging the huge third floor of Matthew Wheelon's mammoth store in Elizabeth Street, Sydney, to where the girl stood listening with disdainful unconcern to the excited remarks of a very obvious shopwalker and a still more obvious lady store-detective. "Any trouble?" Greyson tapped the shopwalker on the shoulder. "Shop-lifter!" The man turned suddenly. "Say, who are you?" The officer turned to the girl. "Prove it!" A bright, gamine smile parted the pursed lips. "Heard of you before. How d'you do?" For a moment a spark of merriment in the detective's eyes answered the girl's smile. It went as suddenly as it came. He turned to the shopwalker. 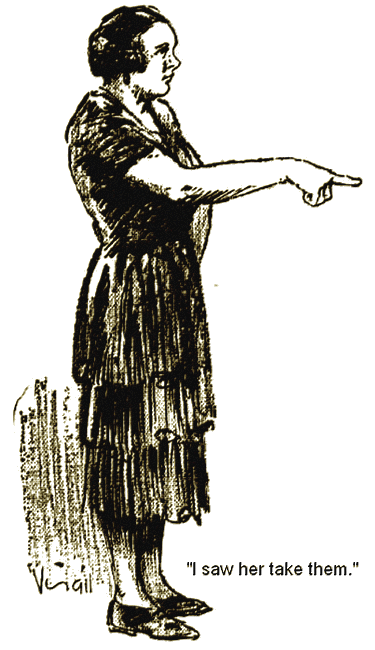 "She refuses to be searched unless first given in charge," the woman detective answered, quickly. "I saw her take them." The woman detective was trembling with anger. "When I spoke to her she insulted me." "A pair of silk stockings." "I don't know. She has them; I'm certain of that." "Can't you do something?" The shopwalker turned to the detective, almost pleadingly. "People are watching us. There'll be a crowd presently. I'll leave it in your hands." "Not unless you formally give her In charge. That is, unless Miss—" He looked at the girl, expectantly. "Cronig. Mary Cronig." Again the flickering smile crossed the girl's lips. "Object to this lady searching you, Miss Cronig?" Greyson spoke easily. "I shouldn't feel pleased." Mary looked direct into the detective's eyes. "No objection to a search, then?" "No, not at all." Mary's manner suddenly changed. The quick smile came again, this time to stay. She caught at the detective's arm, arranging herself by his side. "Can't be done here. Send them on to the office; I'll go with you. That good enough?" "Suit me." The detective nodded to the shopwalker. "By the way, you haven't an odd pair of stockings on you?" "I should be in a fix if I had." The girl beamed up at the tall officer delightfully, walking easily towards the offices at the end of the long room. At the door she paused suddenly, catching Greyson by the arm. "See that girl, Mr. Greyson; the one with the golden curls. Let her search me; not that woman." "I thought only gentlemen preferred blondes." Greyson grinned. He beckoned to the shop-girl to accompany them. "All right. Let's get it over." He hold the door for the two girls to pass into the outer office. Mary hesitated a moment, standing just within the door. The shop-walker motioned her angrily to an inner room. Mary braced herself with an apparent effort. She walked slowly across the room, passing between the shop-walker and the woman detective. Suddenly she stumbled, catching at the woman and almost dragging her to the ground. With a slight laugh she regained her feet and went into the room where the blonde girl was awaiting her. The door closed and for five minutes there was silence. Then the inner door opened abruptly and Mary and the shop-girl came out, chatting and laughing easily. The latter caught the detective's eyes and shook her head, negatively. "Nothing!" Greyson could not help smiling as he turned to the crestfallen shopwalker. "It's up to you now, mister. This young lady's entitled to your apologies. That's the worst..."
"Ridiculous!" Mrs. Andrews spoke impatiently. "I'm certain she took them. Now, if I'd searched her..."
"You would certainly have found them on me." Mary turned to the woman, speaking gravely and with significance in her voice. "You've done that before, Mrs. Andrews—found stolen goods on other girls you're searched haven't you." "Satisfied, Mr. Greyson?" The girl turned nonchalantly on the detective. "Am I still under arrest?" "Haven't been there, yet, Miss Cronig." Again the stern lips of the detective twisted to a smile. "Then I let you search me without being arrested." The girl spoke quickly. She nodded towards the woman detective. "What do you think of her?" "In what way?" Greyson spoke cautiously. He had no intention of becoming embroiled In the evident antagonism between the two women. "I'll speak plainly." Mary turned to face the group. "If I'd let her search me she'd have planted the goods on me. No, hold your tongue, Mrs. Andrews, until I've finished. Mr. Greyson, I let you have me searched without being under arrest. Now have her searched." "You damned huzzy!" With a screech of anger, Mrs. Andrews darted forward, to come up against Greyson's extended arm. "Of course!" The woman had regained some of her control. "Of course I object to such a thing. I'm an employee of the store." "That's no answer." The keen eyes of the detective searched the woman's face. "So far as I understand, Miss Cronig states that if you'd searched her you'd have planted the goods—that's the silk stockings, on her. I guess that means they're on you now. No, don't start to scratch. You've got just one choice: let this girl search you or refer the matter to Mr. Wheelon." "I shall certainly complain to Mr. Wheelon." Mrs. Andrews flounced towards the door, to find Greyson blocking the way. "Search, Mrs. Andrews?" The detective spoke stolidly. The last restraints on the woman's temper gave way. She tried to thrust the detective on one side. Falling in this she flew at him with shrieks of anger, clawing at his face. Greyson caught her by the wrists laughing softly at her futile struggles. "Search, Mrs. Polly Andrews?" He laughed down into her crimsoned face. "Now, Polly, you're giving yourself away. If you hadn't lost your temper I mightn't have recognised you for it's a long time since you caused that scene at Darlinghurst Police Station. No, Polly Andrews. This young lady's—the blonde one—going to search you. If not, you hand in your resignation to this gentleman, right now, and get out of this store in ten minutes. Get me?" He turned to the amazed shopwalker. "You've heard enough, Mr.—Mr.—yes, Mr. Hendry. Guess you've understood. Mrs. Polly Andrews resigns. If she chooses to stay, come round to Hunter Street for her credentials. I'll have 'em ready. Now, Miss Cronig, we'll get out of here." He held the door for the girl, escorting her down to the street. On the pavement Mary turned and held out her hand, impulsively. "Thanks, Mr. Greyson." She spoke with a little gasp in her voice. "I've never had a fairy god-mother, but..."
"Guess I'd make a bad hand of the fairy, business. Here, hold up, kiddie!" Ho seized the girl as she stumbled against him. "What's the matter?" He whistled slightly as an explanation dawned on him. "Here, when did you feed last, Miss Cronig?" "Yesterday." The word came in a whisper from the pale, drawn lips. "Then it was true." Greyson looked into the girl's face, suspiciously. "My stockings are quite sound, thank you!" The girl's assumption of gaiety was pathetic. "About half a million, rather more, I think." She laughed at the look on his face. "All the men in Sydney, y'know. Half of 'em feed one on chocolates and kiss when parting; the others feed more satisfactory, but...but...they don't want to part...too soon." "You poor kid!" Greyson slipped his arm In the girl's. "I was going homo to dinner, but—"
"You'd better go." Mary quietly released her arm. "I'm not stopping you." Greyson eyed the girl. He realised now that her antagonism in the store was due to exhaustion. "If you want to know, I'm out of work—wouldn't sell my body with my labour. Turned out of my lodgings because I owed too much and declined an...an...arrangement. If you want my address, Mister Detective, mark it down 'The Domain'—until further notice, or..."
"Here's our tram!" Greyson turned towards the roadway. The girl held back. "Come along!" "Married?" She turned suddenly on the officer. "Yes. No kiddies, though. Only the missus and me. There's a spare room always ready." "What'll she say, you blowing in with a bit of fluff on your sleeve?" "Alice ain't a fool!" Greyson growled. WITHOUT a word the girl allowed him almost to lift her to a seat in the car. There was complete silence between them until the tramcar drew up in Randwick High Street. Greyson alighted and helped the girl down. A score of yards along the street he led into a quiet road bordered by pretty red-brick cottages. At one of these he opened a gate and motioned the girl to enter. As they mounted to the veranda the front door opened and a handsome, well-built, grey-haired woman came to welcome them. "Meet Mary Cronig, mother." Greyson bent to kiss his wife. "Mary Cronig, down and out!" There was almost defiance in the clear grey eyes lifted to Mrs. Greyson's face. For an instant the eyes of the women met, and held. Suddenly the elder woman caught Mary to her in a strong embrace, kissing her warmly. "Can you say that at seventeen, child?" There was a slight catch on Alice Greyson's voice. "Nineteen, and I feel like ninety-one!" Although the words were light, tears stood in the grey eyes. Greyson lingered behind, watching the two women pass. into the house. A little puckered frown came between his brows. He was not satisfied. Had the girl really been guilty? MARY did not come down to breakfast; Alice Greyson had said she was to remain in bed and in that house her word was law. Robert Greyson ate his breakfast In silence. As he bent in farewell to his wife she spoke suddenly. "What of her, old girl?" "Leave her to me, Bob?" "Sure. She's a bit of a kid to be up against it." "We—I—could do with a girl, Bob." The woman turned her cheek on the rough cloth of his sleeve. "Duets are sometimes monotonous, Bob." Greyson gulped quickly. He bent and kissed her heavily on the lips and strode out of the house, not looking back. More than once during the day he wondered if he had acted wisely. Alice Greyson met him as he mounted the house veranda that night. "She's gone, Bob." Alice spoke with a slight tremor. "Went while I was out, shopping. Wouldn't come with me. When I returned I missed her. There's a parcel on the sitting-room table addressed to you." Hand in hand they entered the house. Alice almost pulled him to where a small brown paper roll lay on the table. It was addressed In girlish, unformed writing to "Detective-Sergeant Robert Greyson." With trembling hands he tore It open and a pair of silk stockings fell on the cloth. A slip of white paper was pinned to them. You're too good a man for a girl to fool. Remember when I fell against you. Well, don't let the flaps of your jacket pockets turn in. Sorry, turn these in to Matt Wheelon for me. P.S.—I can't say good-bye to Alice. I'm not good enough. —M. When I fell against you! Greyson almost grinned. The little devil! She had come to his side clutching his arm in the store. Alice brought her plate to the side of her husband. Yet it was a silent meal. "Got to put an advertisement in the paper, mother." Greyson rose from his seat, awkwardly. "Yes." Alice looked up at him, listlessly. "Least! I've signed your name to it, mother." Again he hesitated. "Just said: 'Mary Cronig, come home. A pair of silk stockings ain't worth it.—Alice.' That do?—"
"Yes." Suddenly the indecision left the woman's face. She smiled up at her man, linking her arm in his and walking towards the door. "Bob, I think you could alter that a bit. Put in two more words just before my name. Just, 'Love—mother.'"